8:43am A report of a burglary on Wedgwood Ct. is being investigated. 9:59am Officer checked the welfare of a man on E. Mansfield St.
10:31am A report of a breaking and entering on Sherman St. was investigated. 10:59am A false alarm in the 100 block of Brookside Dr was investigated. 11:51am Officers assisted Crawford County Municipal Court. 12:42pm Officers investigated a disturbance in the 200 block of Whetstone St.
1:11pm A disturbance in the 100 block of E. Liberty St. was investigated. 1:33pm A Christmas tree found in the 900 block of Sherman St. was brought to the Police Department. 1:47pm An accident report was taken on Marion Rd. 2:02pm A false alarm was investigated at Bucyrus Family Dental. 2:07pm Officers investigated a tip on possible drug activity. 2:53pm An injury accident was investigated in the 500 block of S. Sandusky Av. 3:51pm Officers assisted a S. Sandusky Av. resident locked out of their house. 3:55pm A purse was reported stolen from a vehicle at Outhwaite Reservoir. 4:54pm A verbal traffic warning was issued on Beal Av. 5:44pm A parking issue in the 500 block of S. Walnut St. was investigated. 6:39pm A report of juveniles playing in the street with no adult around in the 200 block of Woodlawn Ave. was investigated. 7:38pm A report of what sounded like gunshots in the 1500 block of W. Southern Ave. was investigated. 7:54pm A false alarm in the 500 block of W. Warren St. was investigated. 8:36pm A resident in the 500 block of S. Sandusky Ave. reported his garage broken into. 8:38pm Officers warned 2 males against trespassing on the RR tracks in the Blicke St. area. 8:46pm A report of possible drug activity at Bucyrus Estates was investigated. 9:01pm A verbal traffic warning was given in the area of Isaac-Beal Rd. 9:07pm Officers mediated a civil issue at Woodbine Apts. 10:03pm A report of loud music in the area of Woodbine Apts. was investigated. 10:33pm Officers assisted Life Support in the 200 block of W. Rensselaer St.
10:45pm A report of fireworks being set off in the area of Plymouth St. and N. Lane St. was investigated. 10:54pm Officers on patrol investigated 2 suspicious subjects in the area of Hopley Ave. and S. Walnut St.
11:04pm An open line 9-1-1 call in the 1300 block of Whetstone St. was investigated. 12:02am A report of loud music at Woodbine Apts. was investigated. 12:24am Officer s on patrol gave a verbal warning to 2 juveniles about curfew violation. They went back inside their residence. 12:29am Officers conducted a welfare check on a male on Washington Square. 1:09am Officers on patrol investigated a parked vehicle with the dome light on in the area of W. Warren St. and Ridge Ave.
2:04am A resident in the 800 block of Woodlawn Ave. reported hearing someone trying to get into her back door. Officers checked around the home and did not locate anyone. 5:32am A resident in the 400 block Emerson St. reported hearing a loud boom in the area. Officers canvassed the area and did not locate anything amiss. 5:38am A report of a suspicious male on a bicycle in the 200 block of S. Walnut St. was investigated. 7:34am Officers assisted Life Support in the 500 block of Sears St.
8:29am A civil standby was made in the 500 block of Plymouth St.
8:54am An officers assisted a subject in entering his locked vehicle in the 1600 block of Marion Rd. 8:59am A report of a semi-truck damaging a tree in the area of Walnut and Wallace Ave. was received and remains under investigation. 12:10pm A false alarm was received from the 1100 block of Victoria Dr.
12:12pm A report of a sick raccoon at Aumiller Park was investigated. The raccoons were no sick, just trapped in a trash barrel. An officer freed the raccoon. 12:58pm A disturbance in the 100 block of N. Spring St. was investigated. 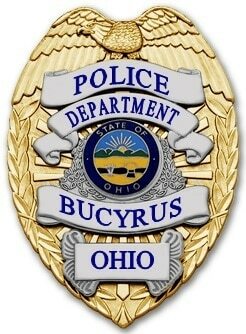 1:29pm A false alarm was received from the 1400 block of Home Circle Dr.
2:21pm A domestic dispute in the Bucyrus Plaza area was investigated. 2:34pm Officers assisted the Crawford County Humane Agent in the 600 block of S. Walnut St.
2:40pm Aiden Leslie, 17, was reported missing from the 800 block of W. Perry Street by his father. He has not been seen since yesterday. 3:29pm A Bucyrus resident came to the Police Department to speak with someone about a civil issue. 3:41pm Officers assisted Crawford County Children Services in the 1400 block of Cullen Avenue. 4:48pm Officers checked the area of Hopley Avenue for an erratic, speeding driver coming into town. 4:49pm Officers assisted a customer with an unruly child at CVS. 5:24pm A traffic issue in the area of E. Southern Ave. and Prospect St. was investigated. 5:42pm Officers checked the area of Marion Road for an erratic, speeding vehicle coming into town. 6:05pm A report of a dog left in a vehicle at Walmart was investigated. 7:06pm Jeana Mulkey, 44, and Randy Warwick, 55, were both arrested on charges of Domestic Violence. They were each transported to the Crawford County Justice Center to be held for court. 7:54pm Ronald Agin, 23, was arrested on charges of Drug Abuse Instruments and Possession of Heroin. He was transported to the Crawford County Justice Center to be held for court. 8:29pm A disturbance in the 200 block of N. Poplar Street was investigated. 8:37pm A domestic disturbance in the 500 block of S. Sandusky Avenue was investigated. 9:47pm The owner of a residence in the 400 block of W. Mansfield Street reported the back door kicked in. 11:19pm Officers spoke to a male on station with a domestic issue. 11:21pm Officers assisted a motorist locked out of his vehicle in the 500 block of N. Sandusky Ave.
12:40am A dispute between roommates in the 200 block of N. Poplar St. was mediated by officers. 12:59am A private property accident at Bucyrus Plaza was investigated. 12:59am Michael Osborne, 21, was arrested for operating a vehicle under the influence of alcohol. He was taken to the Crawford County Justice Center to be held for the violation of his probation. 1:34am A verbal traffic warning was given in the area of S. Spring St. and Euclid Ave.
1:54am A report of fireworks being set off in the 1100 block of Hopley Ave. was investigated. 4:43am A verbal traffic warning was given in the area of Whetstone St. and Wheeler Ave.